The Escape features a panoramic Vista Roof. It has a forward panel that can be easily tilted or opened completely, and there is a fixed rear skylight for passengers in the back seats. 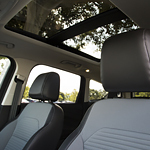 With this roof, you and your passengers can take in plenty of fresh air and sunlight. Another amenity that comes with the Escape is SiriusXM Satellite Radio, and you also get SiriusXM Traffic with Travel Link. You have plenty of entertainment with SiriusXM Satellite Radio because it offers more than 150 channels of music, live sports, comedy, news, and more. With SiriusXM Traffic with Travel Link, you get voice-guided directions so that you can easily make it to your destination.